I'm just back from a recent trip to Ireland, helping co-facilitate a tour for Land, Sea, Sky Travel to the Beara peninsula. Most of the tour, of course, was focused on that job of facilitating for the people on the tour, but I had my own moments of experience as well and as I sit here back at home processing all of that I thought I'd share a little bit of what the experience was like for me. Later I'll write a more detailed blog about the tour and the places we went. Here I just want to explore a bit about my personal experiences. The title of this blog is based on a joke I started making early on, that we were 'following in the track of little hooves' as we went along our journey. 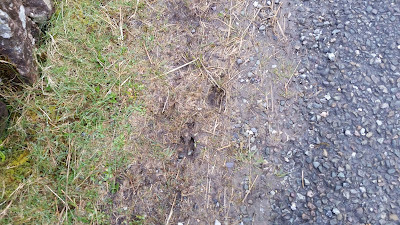 It was only partially a joke though, as we did indeed end up following sheep tracks more than once - on Oileán Baoi they guided several of us to a beautiful spot to meditate and crossing Healy Pass on foot from one viewing point to another they led us along the side of the road. We saw sheep often, not particularly surprising, but it was delightful to see the lambs everywhere and to feel like Bealtaine was more than just pretty words and flowering trees. 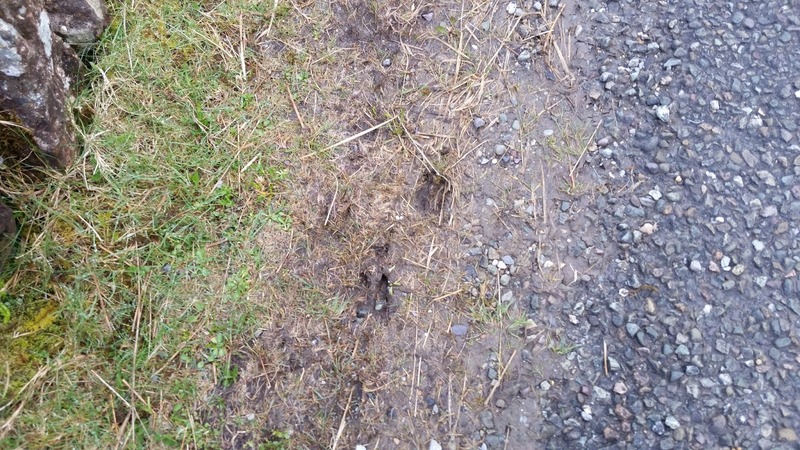 Following the sharply pointed little hoof prints was a way of listening to what the land itself was saying to us. Animals more generally became something of a theme for me on this trip, although I'm not sure I can explain exactly how meaningful that was. There were domestic animals, including the aforementioned sheep as well as cows and horses; there were black dogs at portentous moments and black and white cats lurking along paths. At the Burren Bird of Prey Centre we met a variety of magnificent birds and I was able to assist by holding a barn owl, which is like a dream come true for me. There were also many wild animals that crossed my path in what seemed like important ways. When my plane landed I was greeted by the sight of rabbits in the field at the airport; I saw seven of them which seemed a good omen. 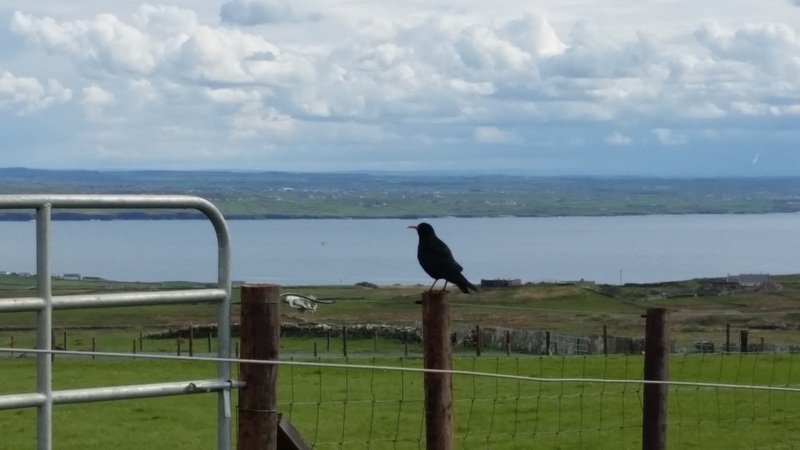 When we went to the Cliffs of Moher I made friends with a Chough, who after I started talking to him as he dove around the edge of the cliff came over and landed near me for a conversation. We went on a whale watch and saw a basking shark, minke whales, and seals and when we went over to Oilean Baoi [Dursey Island] I saw dolphins in the channel. I saw swans at Loch Guir, and Gougán Barra, and Poulgorm; the two at Poulgorm hung out with me for hours (in fairness they were used to tourists feeding them and seemed very docile for swans). I also saw a wild owl at Poulgorm one evening, which felt very special. The last animal I saw at Dublin airport was another rabbit. During this trip we went to many significant locations - places that were well known or maybe less well known but archaeologically significant. They were all amazing of course and important...but the places that spoke most to me, the places I felt the most strongly connected to weren't famous ones, or at least weren't in themselves famous. I enjoyed the camaraderie at the big locations and the feeling of helping others (or trying to) in their quest to connect to these places, but for me it was the odd spots I stumbled across, sometimes fully unexpected and unintended that really grabbed me. There was a Whitethorn outside the circle of stones at Ciorcal Liag na Gráinsí [Grange stone circle] that I immediately connected to in a deep way, and later in the trip when we came back to the site and were able to access an adjacent smaller circle there was also a solitary Thorn there that spoke loudly to me. Of course I have an affinity for Whitethorns so maybe that's no surprise. At Oileán Baoi [Dursey Island] there was an out of the way spot across from Crow Head that had some very powerful energy to it. And when we climbed up to see the stone circle(s) at Caiseal Chaoilte - or Caiseal Coillte, the signs couldn't agree on the Irish - it wasn't the stone circles that drew me but a small outcropping of rock jutting up into the air a short way off. In the same way at Gougán Barra while the Slanan healing stream was beautiful it was a spot near the shore of the lake that spoke strongly to me. I spent a lot of time at Poulgorm near our hotel, listening to the water and the wind and feeling the flow of it all around me. The place that I connected the strongest to, by far, though was the ruins of a building at the edge of a cemetery near saint Gobnait's shrine in Baile Bhúirne. I stumbled across it entirely by accident. Our group had stopped at the tobar Ghobnait [Gobnait's well) on the way up to the shrine and when most of the group went back to the road to continue to the shrine I and a few others didn't. Instead we decided to follow a small trail through the woods. It led to the ruins of a large house, which the group stopped to explore. I headed off into the woods, following the pull of something calling me*. 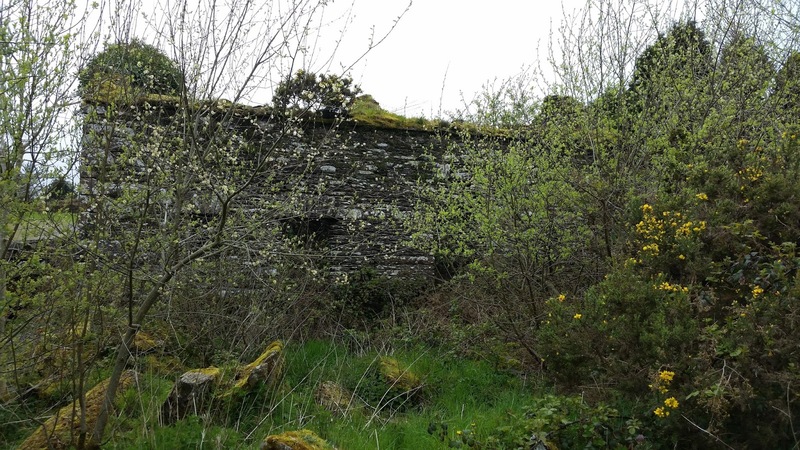 After some wandering through the trackless woods I found myself inside high stone walls with the ruins of a building, surrounded by blooming gorse, blackberry, young trees, and thick-growing underbrush. The building was like a siren song, calling me in**. I stood for a while as close as I could easily get, just speaking to the spirits there and listening to what they had to say to me. I could not get inside the building, which was surrounded at this point by a small stream and heavy underbrush and at then several of my adventurous companions had arrived on the scene making me reluctant to involve others in further risky shenanigans. 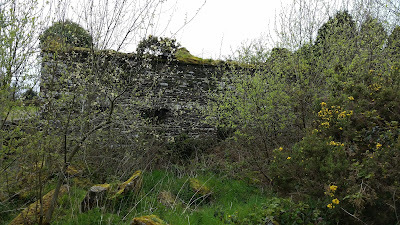 We found our way into the cemetery and then over to the area where saint Gobnait's statue is, but I kept being drawn back to the site of the ruined building. I felt like I belonged in it. I wandered over to the side of the building against the road, peering into the windows, touching the stone. 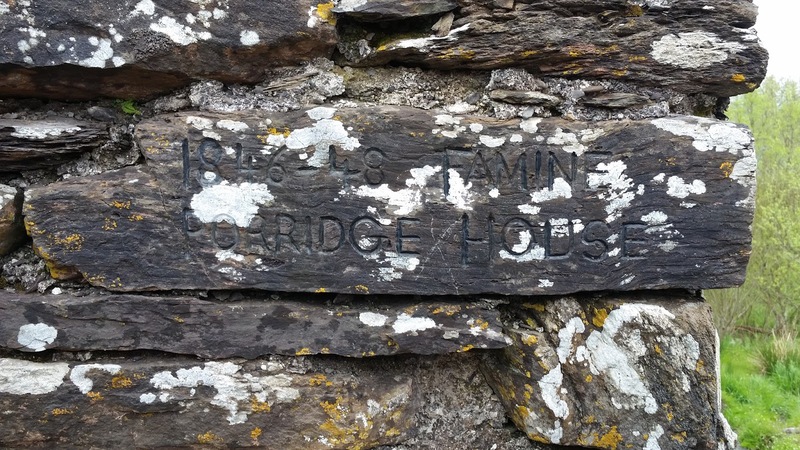 At the far corner was a plaque which read '1846-48 Famine Porridge House'. Reading that gave me a physical jolt. There was a haunting spirit to the place but also a sense of belonging and home that made me want to crawl through the window and move in. I also found myself living my service to the aos sí on this trip in many ways. I listened to the spirits of the places I went, to the ones who spoke to me and the ones who didn't. 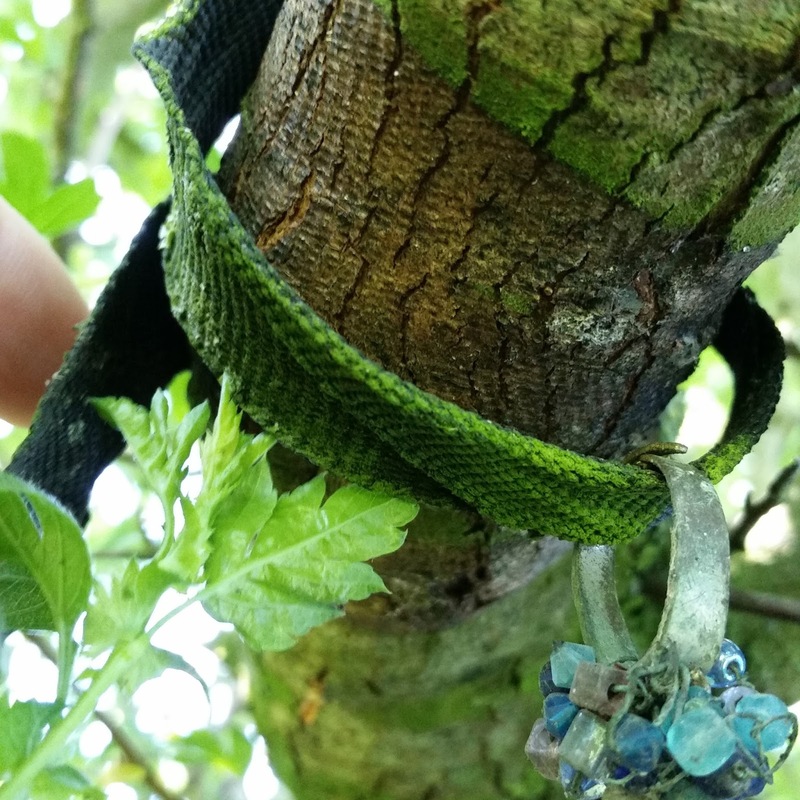 I found myself compelled to work to help and heal Thorns being damaged by improper rag tree practices. I've been an advocate of proper rag tree traditions before now of course but on this trip I found the sight of damage to the trees bringing me to tears and whereas before I cared about it now I find it's a compulsion. Removing a nylon strap from a Hawthorn; you can see the way the strap is restricting growth of the limb and the way the bark has grown into the imprint of the nylon pattern because of the tightness of the material. This will kill the entire branch over time. 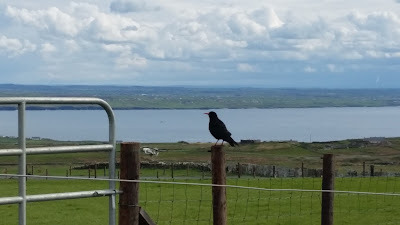 My first trip to Ireland was a profoundly initiatory experience that changed my life. This trip was about service on many levels - about doing what little I could to work for the land and the spirits of the places I was going to. It was also about being open to the experiences as they came and accepting the journey as it happened instead of projecting my expectations onto it. There was no profound moment here, no life changing shift, but it little moments and small things that made me feel a sense of connection to some places. **seriously don't be me here. The smart thing to do in this situation is not go wandering into dangerous ruined buildings.